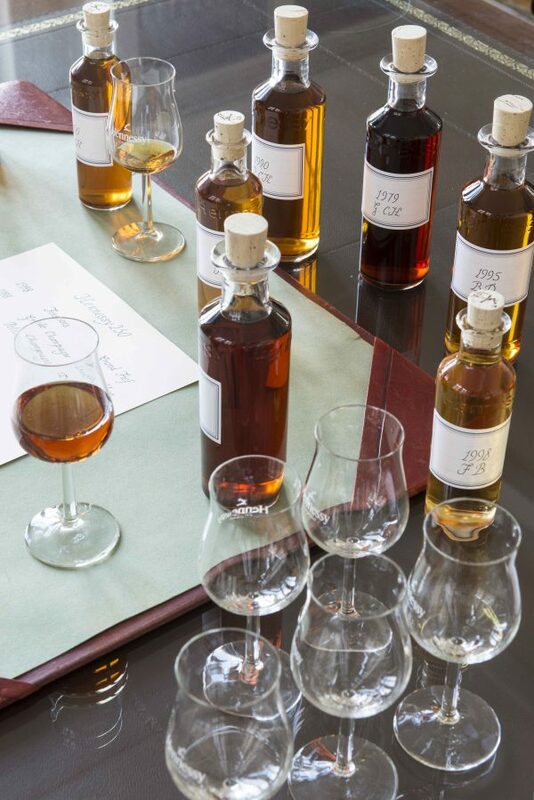 COGNAC, France—At Hennessy’s headquarters, there’s an unmarked, invite-only room where the eight-member Comité de Dégustation, or tasting committee, meets at 11 a.m. sharp, daily. Huge windows flood the space with natural light, revealing the vast color variation in the hundreds of vials of eaux-de-vie lining the room’s walls. On a given day, the committee tastes upwards of 50 samples in varying stages of development with one common goal: Identify the eaux-de-vie destined for greatness, to ensure exceptional quality and consistency for future blends. This committee, the only of its kind, has held the keys to the world’s best-selling cognac for over a century. 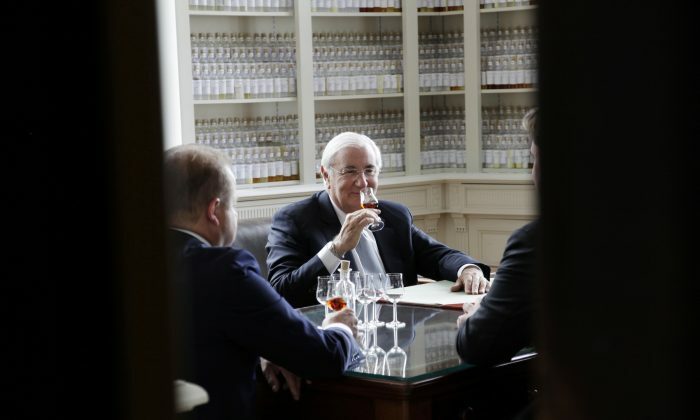 The key master, Yann Fillioux, stepped down from his perch as Master Blender in July 2017 after devoting 50 years to the art of tasting, aging, and blending cognac. The Fillioux family has been associated with Maison Hennessy, as producers or blenders of eaux-de-vie, for over 200 years. At age 19, Yann was training at Hennessy under the tutelage of his uncle Maurice. During his first ten years, he specialized in tasting and selecting young eaux-de-vie, focusing particularly on the first two or three years of the aging process. Over the next five years, he shifted his focus to blending. In 1996, he created Richard Hennessy. Then in 2010, Paradis Imperial. These offerings draw from the finest eaux-de-vie in the reserves of Maison Hennessy and sell for thousands of dollars per bottle. Fifteen years of training proved ample time to master the notes for Renaud Fillioux de Gironde, who, in July 2017, inherited the Master Blender title from his uncle Yann. I was honored to sit down with Yann in Cognac before he passed the torch, in the very room where the tasting magic happens, to discuss tasting, blending, and the legacy that is Hennessy. His English is far better than my French. The Epoch Times: The bottles lining this room are impressive, almost intimidating. What differentiates an exemplary eaux-de-vie? The Epoch Times: By elegance, do you mean a feeling that you get? Mr. Fillioux: It’s perfection. When you have elegance, there is nothing obvious, because if it’s obvious, it’s not elegant. If the wood is present, it’s not elegant. One or two samples out of 1,000 have this level of elegance. It’s more than smooth: Everything has to be done perfectly to achieve this elegance. The Epoch Times: Is that a pretty standard ratio, one eaux-de-vie for every thousand? Mr. Fillioux: If we start with 4,000 samples of eaux-de-vie from a year and start aging, at 40 years, out of those only four or five will prove to have this exceptional elegance. From the beginning we said, “This cognac is very promising and has high potential,” and so we aged it very carefully. The Epoch Times: Tell me more about the tasting committee. Mr. Fillioux: We are eight tasters of different ages. Two younger tasters joined recently. What we transmit through the committee over time is Hennessy’s “taste.” We don’t discuss with competitors and we don’t know what they think. Hennessy’s taste is learned by these younger tasters at this table as we transfer our knowledge to them. We meet every day in this room, tasting 40–50 eaux-de-vie, and decide what cognacs we will buy or refuse, and if we buy it, what is the potential of the cognac? Quality is important, but so is consistency of quality. The Epoch Times: Let’s say you identify a cognac that is very good—what happens next? Mr. Fillioux: After we buy them, they go into barrels depending on potential. The highest potential cognacs go into very old casks, to bring a small amount of gentle wood at the beginning. If you age high-potential cognac too quickly, wood can cover that potential. Then it’s finished. It can be a good cognac but won’t be exceptional. The Epoch Times: Paradis Imperial is a blend you created in 2010, modeled after a special order Hennessy filled for Russia, correct? Mr. Fillioux: The cognacs selected for Paradis Imperial were selected mostly by my grandfather or great-grandfather and maybe my uncle. They did a great job. And yes, at the beginning of the 19th century we filled a special order for an exceptional cognac and that inspired Paradis Imperial. My successor will be able to produce exactly the same quality within 10 or 20 years. It’s not a limited edition, we can carry it into the future. It’s the ultimate expression of quality and elegance. The Epoch Times: Is cognac to be enjoyed on its own or do you have it with a meal? Mr. Fillioux: If you are drinking Paradis Imperial, spend some time thinking about what you’re drinking. If you drink it too quickly, you won’t enjoy it to the level you could. I drink it neat, and I think it’s a good idea to drink it with a very good friend.